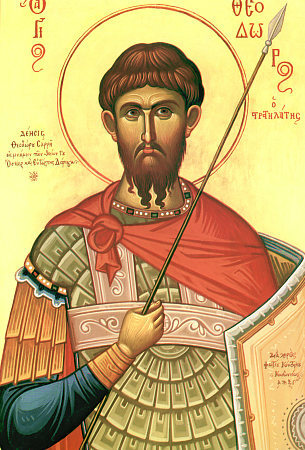 The GreatMartyr Theodore Stratelates came from the city of Euchantum. He was endowed with many talents and an handsome appearance. For his charity God enlightened him with the perfective knowledge of Christian truth. The bravery of the saintly soldier became known to many after he, with the help of God, killed a giant serpent living on a precipice in the surroundings of the city of Euchantum. The serpent had devoured many people and animals, holding in terror all the surrounding countryside. Saint Theodore, having armed himself with a sword and a prayer to the Lord, vanquished it, glorifying amongst the people the Name of Christ. For his bravery Saint Theodore was appointed military-commander (stratelatos)in the city of Heracleium, where he as it were carried out a dual obedience, combining his official military service with an apostolic preaching of the Gospel among the pagans subject to him. His ardent persuasion, reinforced by his personal example of Christian life, turned away many from the pernicious "false-gods". Soon nearly all of Heracleium had accepted Christianity. During this time the emperor Licinius (307-324) began a fierce persecution against Christians. Wanting to decapitate the new faith, he resorted to making persecution against the enlightened adherents of Christianity, in which not without foundation he saw as the fundamental threat to the dying paganism. Among such was also Saint Theodore. The saint himself invited Licinius to Heracleium, having promised him to offer a sacrifice to the pagan gods. To make this splendid ceremony, the saint requested to be gathered up at his house all the gold and silver statues of the gods which they had in Heracleium. Blinded by his hatred for Christianity, Licinius trusted the words of the saint. But his expectations were cheated: having seized hold of the statues, Saint Theodore smashed them into pieces which he then distributed to the poor. Thus he shamed the vain faith in soulless idols and literally on the shards of paganism he affirmed the laws of Christian charity. Saint Theodore was arrested and subjected to fierce and refined torture. The witness was the servant of Saint Theodore – Saint Varos, who barely found in himself the strength to write down the incredible torments of his master. Sensing the nearness of death, Saint Theodore yet turned to God with a last prayer, saying: "Lord, Thou hast told me formerly, I am with thee, wherefore dost Thou now abandon me? Behold, O Lord, how the wild beasts do tear at me on account of Thee, my eyes are gored out, my flesh lacerated with wounds, the face is smashed and teeth broken, and they have my bared bones on a cross: remember me, O Lord, having suffered a cross on account of Thee, the iron and fire, and being raised up on nails for Thee: wherefore accept my spirit, since my life doth expire". God however, by His great mercy, willed that the end of Saint Theodore should be as fruitful for those near him as was his life: He healed the bruised body of the saint and brought him down from the cross, on which he had been left all night. In the morning the imperial soldiers found him alive and unharmed; persuaded in their own eyes of the infinite might of the Christian God, they right there, not far from the place of the unsuccessful execution, accepted holy Baptism. Thus Saint Theodore became "like a day of splendour" for those pagans dwelling in the darkness of idol-worship and he enlightened their souls "with the bright rays of his suffering". Not wanting to flee a martyr's death for Christ, Saint Theodore voluntarily gave himself over into the hands of Licinius, preventing the people believing in Christ from rising up against the torturer, with the words: "Beloved, halt! My Lord Jesus Christ, hanging upon the Cross, held back the Angels and did not permit them to take revenge on the race of man". Going to execution, the holy martyr with but a word opened up the prison doors and liberated those locked up from their bonds. The people also who touched at his robe were restored of body, healed instantly from sicknesses and freed from demons. By order of the emperor, Saint Theodore was beheaded by the sword. Before the death by execution he told Varos: "Neglect not to write down the day of my death, and put my body in Euchantum". Together with these words he asked for an annual remembrance. Then, having said "amen", he bent his neck beneathe the sword. This occurred on 8 February 319, on a Saturday, at the third hour of the day.